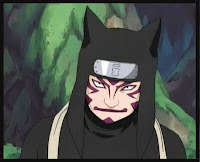 Kankuro is initially characterized by his apparent dislike for children, as seen when he is noticeably irritated while in the presence of someone younger than him. Though, this seems to have gone away as time passed by. This is most evident when he is with Gaara, who Kankuro is forced to put up with due to the fear his younger brother imposes on him. Despite their apparent differences, Gaara and Kankuro become very close over the timeskip as Gaara begins to confide in Kankuro and shares his dreams of wanting to risk his life to protect Sunagakure. As such, Kankuro has become very protective of Gaara, willing to challenge anyone who puts Gaara down in his presence. When Gaara is captured by Akatsuki, Kankuro rushes to his brother's aid in an attempt to save him and even after being nearly killed as a result he does not falter in his resolve to find Gaara. He is a talented puppeteer, and with each of his appearances in the major arcs is seen with a new puppet in his arsenal. The three puppets that have been introduced were all originally created by Sasori, and came into Kankuro's possession some time after the former left Sunagakure. Karasu, the first of Kankuro's puppets to make an appearance, has been heavily modified by Kankuro. Because of this it is highly offensive, having numerous concealed weapons and being able to detach any of its limbs for separate attacks. 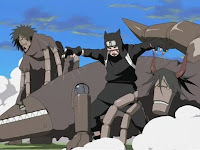 Kuroari, the second of Kankuro's puppets to make an appearance, is used to capture opponents for assassination purposes. Once an opponent is captured within it each of Kuroari's arms convert to saw-blades and slice through the confined opponent. Sanshouo,the third of Kankuro's puppets to make an appearance, is not seen in action in the manga. In the anime, Sanshouo is shown to have a hollow body that Kankuro can take cover in to defend against attacks.